In Bangladesh, annual flooding can disrupt school for almost a million students. In many areas, roads are impassable during the rainy season from July to October, when rivers rise as much as 4 meters (12 feet). In the worst scenarios, people are drowned and left homeless. In 1998, flooding inundated two-thirds of the country, killing 700 people and leaving 21 million people homeless. The future is not going to get better with scientists projecting over one million Bangladeshis displaced by rising sea levels by 2050. 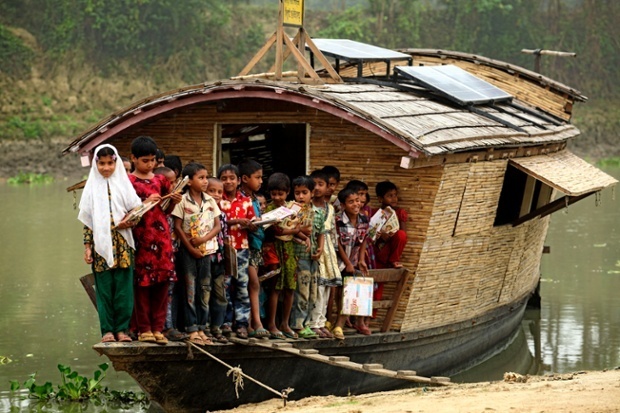 Solar powered school boats offers education to kids in Bangaldesh (Image: Shidhulai Swanirvar Sangstha). The history of Shidhulai from founding to today was an arduous process. He founded Shidhulai with about $500 in 1998, when he graduated with an architecture degree from the Bangladesh University of Engineering and Technology in Dhaka. Only 22, he had no experience in fundraising but he searched the Internet for organizations that could help him and submitted proposals. It took four years before his first boat school was introduced in 2002. Things took off from there. In 2003, Shidhulai received a $5,000 grant from the Global Fund for Children in the United States, and then $100,000 from the Levi’s Foundation, part of the clothing company that has factories in Bangladesh. 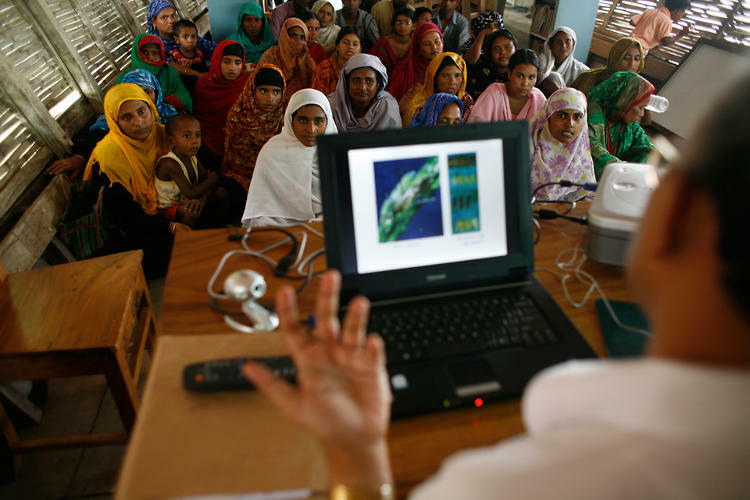 A $1 million grant from the Bill & Melinda Gates Foundation in 2005 allowed Shidhulai to build more boats, buy computers, install solar power, and create a central library. Last year, it added another boat after winning a $20,000 prize from the World Innovation Summit for Education, or WISE, created by the Qatar Foundation. Today, Shidhulai employs more than 200 staff members — including 61 teachers and 48 boat drivers — and 300 volunteers. The boat schools are registered with the Education Ministry, which provides free materials for grades three and four. Shidhulai trains the teachers, who are from the local community and usually have a 12th grade education. The organization now has 20 schools — mostly for the young children of landless families — 10 libraries and 7 adult education centers, all on boats. Students board at rural pickup points and then attend classes for two or three hours, six days a week. In many cases, this will be the only education they get. There are also five floating health clinics that help transport medical staff to remote areas. Each floating solar powered school boat has Internet, a laptop, and a small library (Image: Fast Company). Mr. Rezwan designed the schools by modifying traditional Bangladeshi wooden boats called noka which are about 15 meters (50 feet) long and 3 meters (10 feet) wide with main cabins that can fit about 30 people. Weatherproof roofs withstand heavy monsoon rains and are supported by arched metal beams instead of columns, which would obstruct the classroom. Sitting low in water, it has flexible wooden floors and higher ceilings. The waterproof roofs are outfitted with solar panels. PV modules installed on the boat rooftops provide between 200 Wp, 600 Wp, and 1-2 kWp of power, depending on the electrical demand. The PV modules charge an array of lead-acid batteries through a charge controller, which prevents the battery from being over-charged or deep-discharged, and also include an inverter to convert DC power to AC, thus allowing the use of AC electrical equipment on the boat. Boats also have PV-powered lighting. Rezwan oversees a small army of engineers and technicians, who manufacture everything from PV panels to bicycle-powered pumps. The installation and maintenance of the PV systems are done entirely by Shidhulai’s trained engineer and technicians. Each school boat has Internet, a laptop, and a small library. Construction takes three or four months and costs about $18,000 for local boat builders to modify an old vessel. An additional $6,500 a year is needed to pay for salaries, supplies, fuel, and other costs for each boat. A Shidhulai Swanirvar Sangstha solar powered school boat (Image: Shidhulai Swanirvar Sangstha). Shidhulai doesn’t just work on solar powered school boats. It is also using local resources and solar energy to transform the entire community. By distributing three types of solar lamps to students who attend school regularly, hardworking students and their families can continue to do their work even after dark. The lamps can light homes or charge cell phones, and the batteries can be recharged at the boats weekly. Though flooding will continue in Bangladesh, the future appears bright thanks to social entrepreneurs like Rezwan who has used local resources combined with modern solar energy devices to create solar powered school boats. Other countries are also taking notice. So far, Shidhulai’s floating solar powered school boats model has been replicated in Nigeria, Cambodia, Philippines, Vietnam and Zambia. If you have a boat, perhaps you would be interested in purchasing a set of solar panels for your boat to see how renewable energy can help you reduce your costs. If you are feeling generous, Shidhulai is always looking for donations. I really enjoyed this site and the links. Very innovative and makes me think outside of the box. Thanks Shen Ge for sharing. I’m so proud of this accomplishment and looking forward to our future works. Thanks Efrem. Let’s see how we can help each other. I may be interested in writing some NGO grants with you since I enjoy writing and getting some funding to do interesting renewable energy projects beneficial for the community is of great interest to me.